Armenia marked the centenary on Friday of a mass killing of Armenians by Ottoman Turks with a simple flower-laying ceremony attended by foreign leaders — including Russian president Vladimir Putin — as Germany became the latest country to respond to its calls for recognition that it was genocide. Turkey denies the killing of up to 1.5 million Armenians in what is now Turkey in 1915, at the height of World War I, constitutes genocide and relations with Armenia are still blighted by the dispute. The parliament in Germany, Turkey's biggest trade partner in the European Union, risked a diplomatic rupture with Ankara and upsetting its own many ethnic Turkish residents by joining the many Western scholars and two dozen countries to use the word. Its resolution, approved overwhelmingly, marks a significant change of stance in a country which has worked hard to come to terms with its responsibility for the murder of six million Jews in the Holocaust. Turkish President Recep Tayyip Erdogan said on Friday he "shared the pain" of Armenians, but as recently as Thursday he again refuted the description of the killings as genocide and has shown no sign of changing his mind. The French and Russian presidents, Francois Hollande and Vladimir Putin, were among guests who placed a yellow carnation in a wreath of forget-me-nots at a hilltop memorial near the Armenian capital Yerevan and led calls for reconciliation. "Recognition of the genocide is a triumph of human conscience and justice over intolerance and hatred," Armenian President Serzh Sarksyan said in speech under gray skies, with many guests wrapped in coats or blankets. "France fights against revisionism and destruction of evidence, because denial amounts to repeat of massacres," he said, describing his own attendance as "a contribution to reconciliation." Putin warned that neo-fascism and nationalism was on the rise in the world, the same terminology he uses to describe what Russia regards as radical elements in Ukraine, whose forces are trying to put down a rebellion by pro-Russian separatists in the east. "But remembering the tragic events of the past years we must be optimistic about our future and believe in the ideals of friendship … and mutual support," Putin said. The European Parliament also refers to the killing in 1915 as genocide, as did Pope Francis this month, prompting Turkey to summon the Vatican's envoy and recall its own. Other countries, including the United States, have refrained from using the term. Predominantly Muslim Turkey, which has no diplomatic ties with Armenia, says many Christian Armenians were killed in partisan fighting during the war but denies it amounted to genocide. It says there was no organized campaign to wipe out Armenians and no evidence of any such orders from the Ottoman authorities. In February, Armenia, a poor country of 3.2 million that for decades was part of the Soviet Union, withdrew landmark peace accords with Turkey from parliament, setting back U.S.-backed efforts to bury a century of hostility between the neighbors. But Sarksyan said Wednesday that he was ready to normalize relations with Turkey, stating that there should be no preconditions in restarting the peace process and would not insist the Turks accept they committed genocide. In another sign of reconciliation, European Affairs Minister Volkan Bozkir attended a memorial service at the Armenian Patriarchate in Istanbul, the first time a Turkish government official has taken part in commemoration events since 1916. Anniversary events in Armenia this week included an open-air ceremony on Thursday at which the Armenian Apostolic Church made saints of the victims of 1915, and will culminate in a torch-lit march on Friday evening. "We are glad to see that more countries and even the Pope recognize Armenian genocide. It should be done so that it is never repeated," Susana Karapetyan, a 32-year-old resident of Yerevan, said earlier this week. 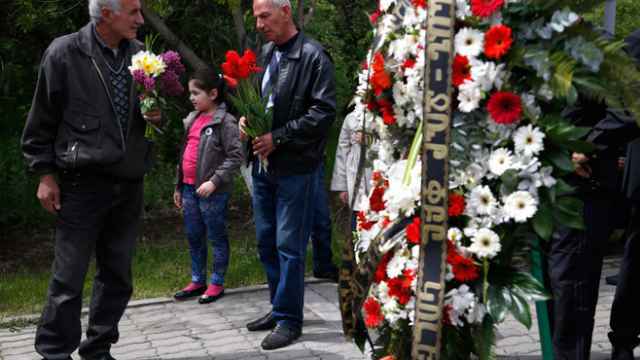 Members of the Armenian diaspora around the world were also expected to hold ceremonies remembering the dead.